The First Lady hopes to entice Americans away from their junk food past to a healthier, more delicious future. 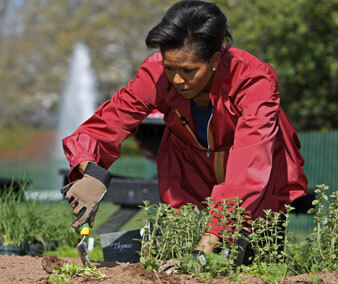 Michelle Obama digs into the White House kitchen garden. Michelle Obama’s stated message was simple and was clearly aimed at her fellow Americans: fresh food tastes better and is better for you, so kids and grown-ups alike should eat lots more of it. “A real, delicious heirloom tomato is one of the sweetest things you’ll ever eat,” she told the 10-year-olds, adding that freshly picked vegetables were what prompted her daughters to try new kinds of foods. What made Obama’s message so subversive was something she left unsaid: the food most Americans eat nowadays is not fresh, tasty or healthy. The superiority of fresh ingredients may be obvious to Italians, but it is a truth most Americans long ago forgot, if they ever knew it in the first place. Over the past fifty years, the United States has been transformed into a fast food nation, in author Eric Schlosser’s phrase. What the typical American eats is not so much food as it is highly processed food derivatives that have traveled thousands of miles since leaving the farm, losing along the way most of the flavor and nutritional value they once possessed. To disguise such losses, food manufacturers overload products with fats, salts and sweeteners, especially corn syrup–additives that, along with the massive portions typically served in the United States, help explain why nearly one in three Americans is obese. Now, by publicly championing fresh local food, Michelle Obama clearly hopes to entice Americans away from their junk food past to a healthier, more delicious future. And that is what makes her message so far-reaching. Change America’s eating habits and you can change the world. Shifting to a greener diet would be good not only for the health of America’s children and families but the health of the planet. The American diet, and the food production and distribution system that supports it, is one of the main drivers of global warming and a host of related hazards, from deforestation to air, soil and water pollution. Most people know by now that our civilization must fundamentally change the way it produces and consumes energy if we are to stop global warming. Far fewer people realize that it is equally important to change the way we produce and consume food. As currently constituted, the global food system is a climate killer. Coal-fired power plants and gas-guzzling vehicles get more criticism, but farms, restaurants and supermarkets are bigger culprits. Globally, the agricultural sector releases more greenhouse gases than any activity on earth except for constructing, heating and cooling buildings. Agriculture’s large greenhouse footprint is due mainly to its heavy reliance on fossil fuels to grow and transport food to market, as well as the increasing popularity of the meat-rich American diet. Meat production accounts for 18 percent of global emissions, according to the UN Food and Agricultural Organization, in part because livestock emit large amounts of methane, an exceptionally potent greenhouse gas. Humanity cannot hope to halt global warming unless emissions from the food sector are cut dramatically. This suggests that food should be high on the agenda during the discussions leading up to the crucial meeting in December in Copenhagen, where the world’s governments will negotiate the next round of emissions cuts. Yet so far food has gotten little attention, with one notable exception. In September, Rajendra Pachauri, the chair of the Intergovernmental Panel on Climate Change, attracted a brief spasm of media coverage when he urged people to consider eating less meat as a way to combat climate change. “Given that industrial agriculture is one of the major contributors of greenhouse gas emissions, it’s astonishing that international climate negotiations overlook both its impact and its potential contribution toward mitigation, as well as adaptation,” says Debi Barker, international program director of the Center for Food Safety, an NGO in Washington. Barker argues that many NGOs are also overlooking the links between agriculture and climate change, a shortcoming her organization is trying to rectify by launching a “Cool Food” campaign to build a global food and climate network of NGOs. What has gotten attention recently in some government circles is the other half of the food-climate change equation–that is, how climate change threatens food production. As global warming intensifies in the years ahead, scientists say, temperatures will rise, droughts will deepen and pests will become more pervasive. In China, recent studies have concluded that yields of wheat, corn and rice could decrease by 37 percent in the latter half of the century if adaptation measures are not implemented. Since China is the world’s leading producer of wheat and rice, such shortfalls could drive up prices on the world market, with the result that poor people worldwide, especially mothers and children, will be unable to afford enough to eat. The best response is a shift to more organic farming and so-called ecological agriculture, says a new report issued by Greenpeace China and lead author Lin Erda, one of China’s most eminent climate scientists. Reducing the use of chemical fertilizers, shifting to no- or low-till forms of cultivation and combing duck ponds with rice paddies not only reduces the greenhouse gas emissions associated with agriculture, the report points out, it also makes the agricultural system more resilient against drought, pests and other inevitable impacts of climate change. John Beddington, chief science adviser to the British government, warned in March that climate change and population growth together could produce a “perfect storm” of devastating food, water and energy shortages by 2030. Days later, Nina Fedoroff, chief science adviser to Secretary of State Hillary Clinton, said that if nothing were done, a billion people could face famine in the twenty-first century and even wealthy countries like the United States and Britain would struggle to feed their people. But there are solutions, even for the poorest of places. Some of the most encouraging stories come from Africa, the continent climate change will hit hardest. In Niger, villagers have invested in rejuvenating parched soils and ravaged forests with remarkable results: despite recurring drought, greenery has returned to the villages, bringing with it water supplies, food production and higher incomes. In China, the United States and other big producing nations, boosting the efficiency of notoriously wasteful irrigation systems could save more water than climate change threatens to disperse. Vaclav Smil, a professor at the University of Manitoba and a leading expert on China’s environmental challenges, predicts the Chinese “will be able to feed themselves for many years to come,” in part because their wastefulness offers so much scope for making technological improvements. And of course there is Michelle Obama’s idea of planting a garden, which history shows can have powerful effects. During World War II, Eleanor Roosevelt urged Americans to join her in planting backyard “victory gardens” so that US farmers could concentrate on supplying food to allied forces. Despite initial opposition from the Department of Agriculture, her idea struck a chord with the public; by the end of the war, victory gardens were producing nearly half of the fruit and vegetables eaten by Americans. If Obama’s organic garden proves equally inspiring, she could spark a new green revolution–and not a moment too soon.